I bet you have already seen the Familia iMop that's been selling like hotcakes in major hardware stores in the Metro. Familia has finally introduced the rest of the members of the new Familia Cleaning System which will not only pamper the home but will pamper homemakers as well. I attended the intimate launch last week with other mommy bloggers and members of the press at the Astoria Plaza. But before we were formally introduced to the products, we were first given this letter from Madam. Oh no, cleaning! I didn't expect that we were going to clean. My poor, poor manicured nails. LOL! Don't get me wrong, I love living in a clean home. I think most of us moms do. But you know, in my everyday list of things-to-do, cleaning is so way down there. I often leave the cleaning tasks to the helper who, most often than not, can't get it done the way I want it to be. Besides, no one can touch my personal things, especially the ones on my work desk. Mommy Iris of Entrepremom.info mopping the floor. I thought we're going to stay in that hotel room to clean everything. Thankfully, they took our brooms and mops and replaced them with the iMop and the newest modern Familia innovations, the iSweep, iPolish, and iRovac. 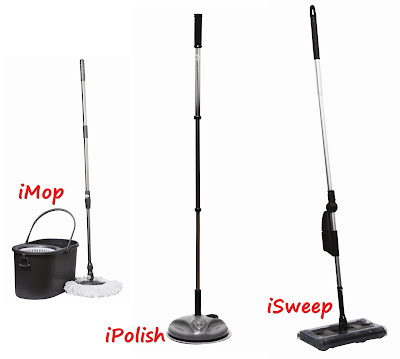 Like the iMop, the iPolish and iSweep are ultra lightweight. These run on rechargeable batteries so no hassle of electric cords getting in the way. The iRovac, a compact vaccuum system that roves around the house on its own. iMop - An all-in-one mop, can be squeezed dry with one hand and has an easily changeable mop head, a long handle. iSweep - Has a quick switch bend, it's surface friendly swiveling cleaner that is lightweight and cordless. iPolish - Usable on any floor, it's an easy cleaning and polishing gadget that you can also use for buffing cars. It's cordless and has a bendable handle. 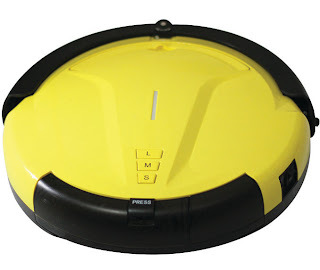 iRovac - It cleans automatically and you can set cleaning schedules. It's self charging; it brings itself to its charger when the battery is low. Its rotating brushes and fine are friendly on floors and it will never fall on stairs or steps as it can detect walls and cliffs. Now, things are going to change a bit in my household, especially now that I have new cleaning partners. I'll have an easy time cleaning parts of the house. I can also do it more often now because I know that it'll only take a few minutes for me to get the cleaning done. These Familia Cleaning System products are available at major hardware stores. Take advantage of the introductory price offers as the iSweep and iPolish are currently sold at only Php 999 each. Such great innovations! Now the lives of moms will become a lot easier with these cleaning tools from Familia. I'd love to own an iMop! sis, are these cleaning system available at Ace HArdware? Wahhh. My iMop has a brother and a sister pala! Sana i could get to review some of them too. It was so nice to see you at the Familia event, Mauie! Hala, ngayon nalinis ng di oras ang bahay namin! These gadgets are love! Cleaning is not exactly something that I like so these will really be a big help for me. I especially want the imop!